Harry Hoover review - is Harry a Pet Vacuum worth having? Often referred to as the green Henry Hoover, Harry Hoover is the most suitable vacuum from the Henry Hoover range for tackling pet hair. Designed specifically for pet lovers, Harry has all the features of Henry with the same power and performance, but also comes with two extra pet-friendly features that means he can vacuum even the most stubborn of pet hair. It may be Henry Hoover that gets all the plaudits, but Harry Hoover is your man if you’ve got hairy pets in your home such as cats and dogs. Read on for our in-depth Harry Hoover review. Dogs and cats. So many of us have them in our homes and we love them to bits, but they do shed a lot of hair and can leave some bad smells hanging around the place. So for people with pets in their homes, having a reliable pet vacuum is somewhat of a priority. Enter Harry the Hoover, a less well-known member of the Henry Hoover range. Harry Hoover has been specifically designed to tackle stubborn pet hair, making him the most suitable vacuum from the Henry Hoover range for pet lovers. Harry is a fairly young member of the Henry Hoover family. He was only introduced after the carbon filter was removed from the Henry Xtra, meaning Numatic no longer had a vacuum in their range suitable for pet lovers. Whilst Harry has many similarities to Henry in terms of his general performance and bag capacity, he comes with two extra features which means he is the vacuum of choice when it comes to pet hair. Harry’s unique HairoBrush is purposely designed to pick up pet hair, and is a dual purpose brush that can be used seamlessly on both floor and on upholstery. The HairoBrush extension itself is fairly narrow, which means that although it is effective at picking up pet hair, it will take a while to clean a large room when compared to using a standard carpet floor nozzle. In addition to the HairoBrush, what makes Harry even more desirable for pet lovers is his MicroFresh activated charcoal filter, which really helps to eradicate odours that pets tend to leave. By combining both the HairoBrush and the charcoal filter, you’ve got a hoover that is great at picking up pet hair and also removes those smells you’d rather not have hanging around your home. 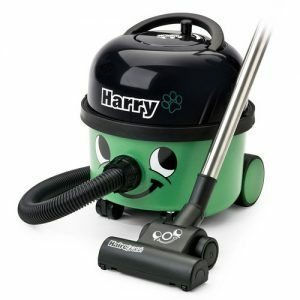 As already mentioned, Harry Hoover is green in colour, which is why he is often referred to as the green Henry Hoover. 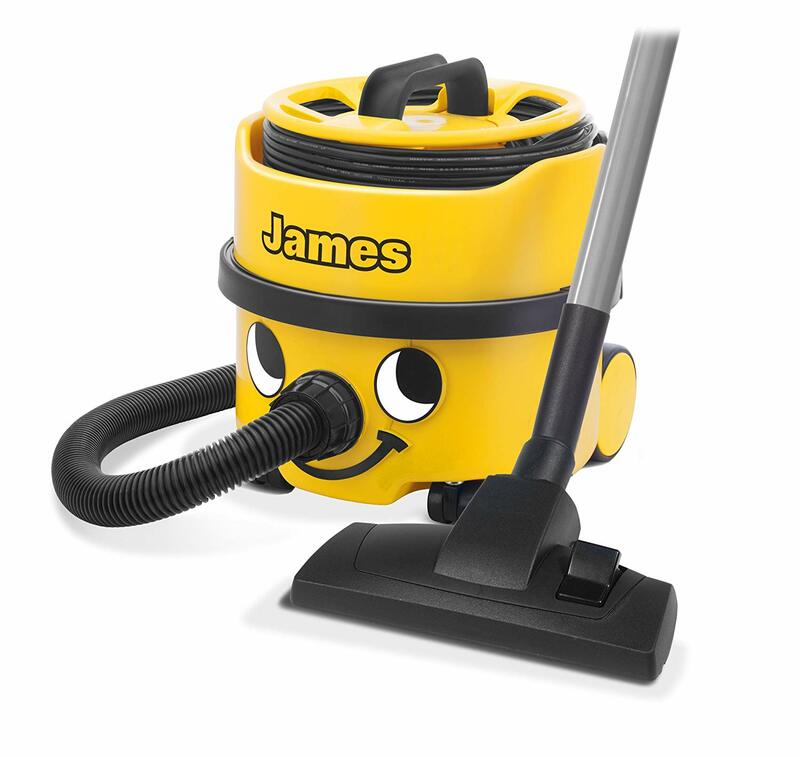 Like all Numatic vacuums within the Henry Hoover range, Harry has a smile on his face and a cheerful exterior. As he is a pet vacuum, Harry comes complete with a a paw print on his head, as well as next to his name. Harry has a built-in carry handle on his top and his cord is stored inside, complete with a Numatic cord rewind. 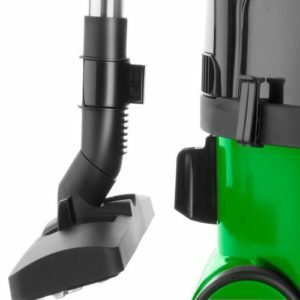 The cord is long at 10 meters so you can clean a large area of your home without having to find another socket outlet, which is a big plus point for this vacuum. Once finished you simply wind the cable up manually. Harry also comes with a two position switch – low for lightweight cleaning and high for standard carpet cleaning. Of course, there’s also a red on / off switch on the back of Harry, too. Also on the back of Harry is a parking slot which enables you to store the main carpet and floor nozzle on the machine itself. In addition, Harry comes with a little clip which you can put most of the accessories on, such as the dusting brush. This is another useful component of Harry as it allows you to immediately access some of his useful accessories from the machine itself. Harry has many similarities to Henry, such as the same body and hose design. Like Henry, he has a nine litre capacity, so thankfully he isn’t a vacuum that will need to be emptied regularly. Like all vacuums from the Henry Hoover range, Harry is a bagged vacuum and uses HepaFlo bags. One difference Harry has when compared to Henry is his weight. Harry is actually slightly heavier than Henry, so would probably not be suitable for elderly people or those who struggle carrying heavy items on stairs. In fact generally, Harry is not the easiest vacuum to use on the stairs due to his weight and slightly awkward shape. On top of the HairoBrush and charcoal filter, Harry has a number of accessories that help to clean all types of surfaces. Apart from cleaning carpets, floors and stairs you can also use Harry all around your home for all your above floor cleaning. The dusting brush can be used on your lampshades, Venetian blinds and other hard to reach places such as the top of your curtain rails. 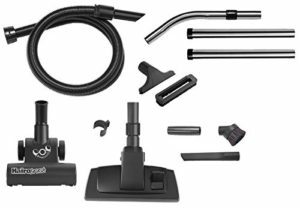 The small nozzle accessory is ideal for cleaning your upholstery, and when cleaning the car or car mats, the slide on brush is your perfect companion. Harry’s crevice tool is another handy add-on, helpling to to reach down the sides of chairs or in the corner of rooms, to remove pesky cobwebs and clean those awkward nooks and crannies. One of the major differences between Harry and Henry is that Harry uses a better class of filter. Harry has a micro fresh activated charcoal filter and it is designed to remove any odors that can come out of a dust-bag when you’re using the cleaner. Especially if you’re picking up pet hairs, they can tend to smell after a while so the activated charcoal in this filter prevents that from happening. The nine litre HepaFlo dust bag are very large and extremely strong. They even have a little cover so you can close the opening to the bag when taking it out to dispose of it. So none of the dust can fly out like it can with a bagless vacuum. Quite a basic design to replace the bag. You simply push it on this bag support tube here with the writing uppermost. Make sure it’s secure in the bin and not trapped around the side and then you can pop the filter back. Pop the motor unit back in place and push your two clips in to secure. How does Harry compare with Henry? Harry has a superior filter system that eradicates smells, as well as a HairoBrush that is great at picking up pet hair. Other that that, Harry is very similar to Henry. How long is the guarantee for Harry? The guarantee is two years from purchase date. Is Harry suitable for hard floors? Harry the Hoover is suitalbe on both hard floors and carpets, as well as upholstery. Has Harry got a turbo button? Harry has a low and high setting. The high setting is very powerful and lifting stubborn hair from carpters and furniture. How easy is to get replacement bags for Harry? It’s easy to pick up new bags for Harry once the original ones have been used. These tend to be very cheap to replace. If you don’t have pet mess to clean up, then it’s highly likely there are better vacuums out there than Harry that will suit your needs. However, if you’re looking for a reliable pet vacuum that is great at picking up stubborn pet hair and removing nasty odours, then Harry Hoover could well be your man. Harry is certainly the most suitable vacuum for pet owners from the Numatic range, and is only slightly more expensive than the likes of Henry and Hetty. He’s also relatively cheap compared to some other pet vacuums, so you could do a lot worse than using Harry to clean up after your furry friends. Can't find the hoover review you're looking for? Search for your favourite vacuum brand or check out our reviews page. HenryHoover.co.uk is a participant in the Amazon EU Associates Programme, an affiliate advertising programme designed to provide a means for sites to earn advertising fees by advertising and linking to Amazon.co.uk.